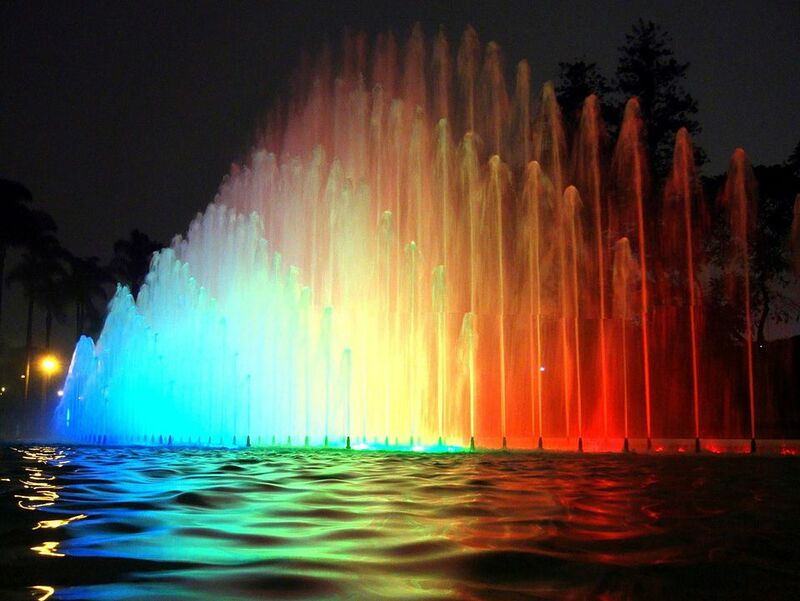 The Circuito Mágico del Agua (Magic Water Circuit) is a series of illuminated water fountains in Lima, Peru. The concept doesn't sound terrifically exciting, at first glance. After all, illuminated water fountains are for kids and romantic couples, right? Most people, however, don't realize the scale of the thing. It's a public water fountain that Guinness World Records has already recognized as the largest in the world. Having now visited the Circuito Mágico del Agua twice, it's easy to see why it's a perfect place to visit in Lima with kids and a frequent recommendation for even the most cynical of adult travelers. The entrance fee is very inexpensive, so it's no threat to your travel budget. The Circuit is open from 3:00 pm to 10:30 pm Wednesday to Sunday and the fountains are most impressive at night. The Circuito Mágico del Agua is located within the Parque de la Reserva, a 19-acre (eight hectare) park inaugurated in 1929. Sandwiched between Avenida Arequipa and Paseo de la Republica, the park was transformed in 2007 with the completion of the Magic Water Circuit, a series of 13 illuminated fountains. The Circuito Mágico project courted some controversy. Converting the historic Parque de la Reserva into a modern water fountain complex wasn’t universally popular, nor was the charging of an entrance fee to enter a public space. The construction cost -- a hefty US$13 million -- also raised a few eyebrows. On a more positive note, entrance fee revenues from the fountain complex helped raised funds for the renovation of the historic Municipal Theatre of Lima, which was reopened in October 2010. As for the public’s reaction to the Circuito Mágico, it was soon evident that the park was a success; less than eight months after its inauguration, the Circuit had already received two million visitors. Laberinto del Ensueño (Maze of the Dream): Don’t let the dreamy name fool you: this is where all the action takes place. Can you make your way to the center of the circle, through the vertical walls of water that suddenly subside before shooting upwards? There’s a good chance you’ll get wet, so put your camera and cash in a plastic bag. Great fun! The water fountains are obviously the main draw in Parque de la Reserva, but the Circuito Mágico del Agua also serves as an educational tool. The Túnel de Exposición, which runs beneath Avenida Petit Thouars and connects the two halves of the park, contains a wealth of information about Lima’s water system. Here you can learn, among other things, where Lima’s water comes from, the trials faced in developing and maintaining the system, and its economic and environmental impact. You’ll also find exhibitions above ground, often displayed near the Fuente de la Ilusión and the statue of Antonio José de Sucre. During May 2012, for example, visitors could walk around a fascinating photographic display featuring old black and white photos of Machu Picchu (including those of the Hiram Bingham exhibition). Nearby attractions include the Museo de Historia Natural (Natural History Museum) on Avenida Arenales and the large Parque de la Exposición about five blocks north of Parque de la Reserva. Peru’s national soccer stadium, the Estadio Nacional del Perú, is also a short walk north of the park (you can see it from within the Circuito Mágico del Agua). The simplest way to get to Parque de la Reserva and the Circuito Mágico del Agua is to jump in a taxi. From Parque Kennedy in Miraflores, the cab fare should be around pretty cheap -- not too bad, especially if you go with a few traveling companions. Alternatively, you can hop into one of Lima’s often-cramped minibusses and make your way along Avenida Arequipa until you reach the park. Another simple option is Lima’s Metropolitano bus system; get off at the Estadio Nacional Station and you’ll be right next to the Parque de la Reserva. The main entrance is just off Avenida Arequipa.